Recent and old scale scars caused by the oak pit scale, Asterolecanium minus. Notice the pits and the rough bark around the old scale scars. Description, biology and damage Adult scale are covered with a hard shell and are about 0.06 inch in diameter. They may be brown, gold, or greenish. They feed on twigs and small branches, with young wood most commonly infested. 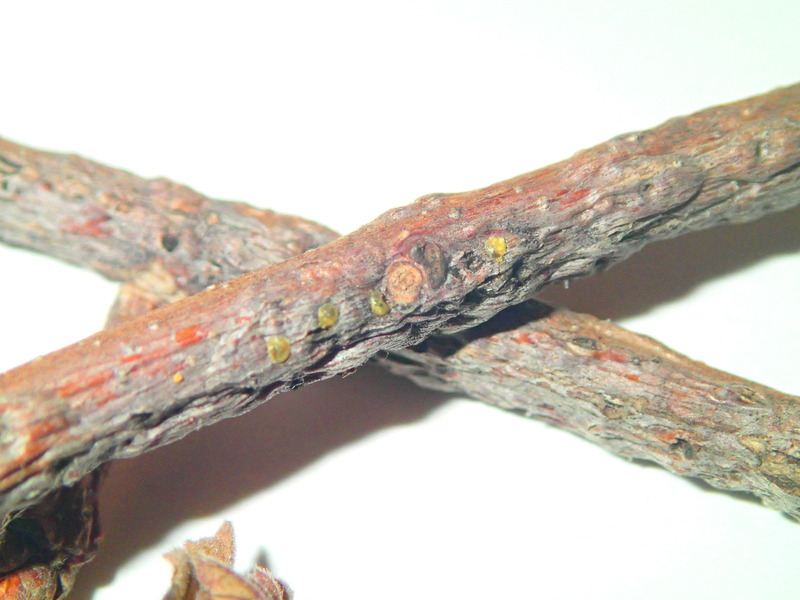 Pit scale feeding causes the tissue of the twig to swell around the insect, so the scale only appears to be in a pit on the bark. Numerous scale on a twig cause it to appear roughened. Severe infestations cause twig dieback. Heavy infestations of pit scale combined with drought stress or anthracnose (a fungal disease) can result in severe weakening or death of trees.